Walking on the streets of Oaxaca City is a must. And like any Mexican destination, visitors will find surprises. Good surprises. 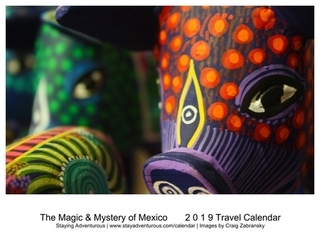 Surprises that force a smile, surprises that create curiosity, and surprises that display the colorful culture of Mexico. One afternoon in Oaxaca I witnessed one such surprise. 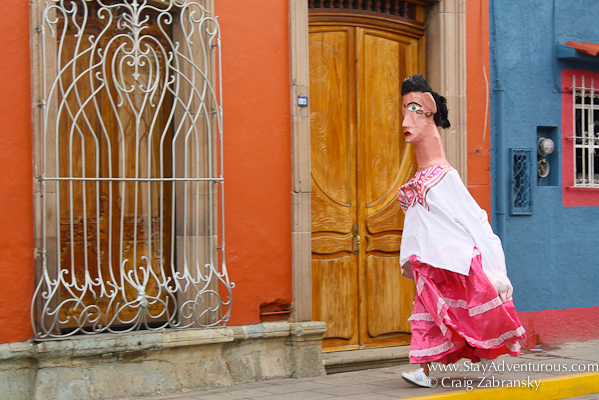 During my stroll of the streets of Oaxaca, I suddenly noticed a person in costume running on the streets of the colonial city. I stopped and captured the moment. I enjoyed my time in Oaxaca, but for some reason I tend to think whoever was dressed in this costume might have even had a better day if he wasn’t too late for the party. This image is part of the 2013 Mexican March Madness. This year it will consist of 31 photos in across the 31 days of March. Takes talent to run in such a getup. Intrigued by the costume design – have you been able to research the event? Love it. Good snag of the in-the-moment scene.